Now is the day of . . .: DBF: Is the Church Segregated? DBF: Is the Church Segregated? In the last two posts, the concept of a racialized society has been described and the fact that the United States is racialized has been proven in areas such as employment, health, and education. It should come as no surprise therefore that the U.S. is also racialized when it comes to religion. Michael Emerson, the primary author of Divided By Faith, has continued to research trends in race and American religion and finds that 92.5% of American churches are segregated, with segregated being defined as over 80% one singular ethic group. And I would add that’s probably a lenient definition of segregated. There is some research to suggest these trends are perhaps waning however, but most of the evidence would show that while some large denominations are becoming more diverse, this is the result of new ethnic congregations, not of increased integration within congregations. The fact is black Christians are very unlikely to attend a predominantly white church, and white Christians are even less likely to attend a predominantly black church. In my next post I will discuss if this is an issue we should even care about (or if it actually might be a good thing as some have argued), but for the rest of this post I want to give a brief historical overview as to how things got this way within American religion without diving too deeply into the “why” of them still remaining segregated. Historically, America and white Christians have been friends. Some elements that have helped define America culturally and historically have been drawn from Christian teaching (i.e. the Protestant work ethic). This makes many American Christians particularly invested in not just there faith, but also in America as an entity, sometimes even confusing which is which. Further, American evangelicals have been very concerned about the work of evangelism (sharing of the evangel = gospel message) within American culture and as a result Christians often times have had reason to seek to conform to the status quo of American society, especially in regard to race. With a couple exceptions, American evangelicals have taken a "don't rock the boat" approach towards society and race in particular. The early story of black-white race relations in America, obviously revolves around the institution of slavery. In the early 1700s, very few Anglos (Christian or not) did anything to even question the institution. Slavery was considered a part of "the American way of life" and one Virginia clergyman wrote, "To live in Virginia without slaves is morally impossible." Even in areas where slavery was not the norm, the furthest you might hear a clergyman go would be the view of Cotton Mather, who strongly believed slaves should be converted and admitted to churches, but also held that slaves ought not ever challenge their position or desire freedom, but ought to be content in this stage (Propaganda takes issue with this advice). Fun Fact: Whitefield invented raising your hands on roller coasters. As the 18th century moved on and the Great Awakening took hold little changed. Inarguably, one of the greatest preachers of all-history, George Whitefield publicly preached to blacks and whites in the same crowd and declared that "Blacks are just as much, and no more, conceived and born in Sin, as White men are." This would have been a bold statement at that time. But, at the same time, Whitefield lobbied Parliament to enact slavery in the colony of Georgia so slaves could be used to work his orphanages. At the turn of the 19th century and with the birth of the American nation-state, the first abolitionist groups began to form. These groups were often tied to religion and it must be noted that while they opposed slavery, they generally were in favor of racialization (if not, outright prejudice). One of their primary advocacies was re-colonization: To free slaves and return them to Africa. Also, it is worth noting, that the rise of abolitionist feelings is easier to trace to the changing economy of the American north, than it is to trace to any sort of moral awakening. Up until the start of the 19th century, black and whites almost exclusively attended church together. While much of this was rooted in a discriminatory fear and these congregations were literally divided with slaves being forced to sit in the balcony most often, it is worth noting, that American Christianity did not begin as a segregated institution. The authors of Divided By Faith entitle their history chapter "From Separate Pews to Separate Churches" highlighting the gradual creation of segregated congregations over time. In the city of Jacksonville, two of the largest churches in the city were once one church (I'm not naming names). But now exist separately because at one point the white members literally gave the building to the black members and built a new church a few blocks away, urging the black members to not come visit. 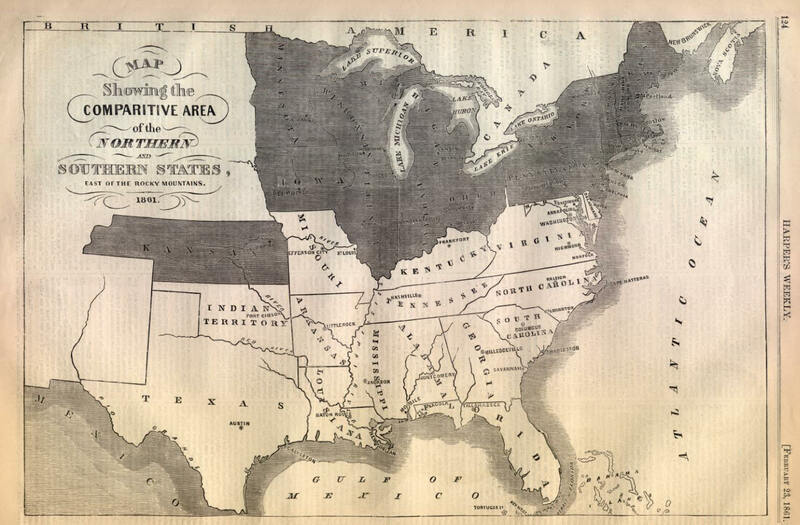 As the mid-19th century neared, positions on slavery and positions on race began to diverge in the North. Clergy and denominations in the North, notably Charles Finney, began to take stronger stances on the institution of slavery even declaring that no slaveholder could simultaneously be a true Christian. However, these views on slavery were tempered with views that racial prejudice itself was not a sin and that the church must be careful not to "divert itself with temporal issues" that may distract from the preaching of the Gospel. This led to opposition to slavery in principle, but rarely in practice. These positions eventually lead the the geographical division of many major denominations into Northern and Southern branches. In this same period, slavery was seen as a moral good in the South. The church in the South in particular identified Biblical (Abraham had slaves, see here why this argument is invalid), charitable (slavery got them out of backwards Africa), social ("We are protecting them"), and political (Abolitionists are dangerous) reasons for the continuation of slavery. And while, Northerners stood in contrast because of their opposition to slavery, the fact that slavery had almost zero impact on the Northern economy meant they could take this stand with no economic repercussions whatsoever. It was not a costly position to take whatsoever. When adjusting for this fact and seeing the rhetoric and vitriol of whites in both regions, it would be accurate to say whites views of blacks were much more alike than they were different in this time period. These attitudes were encountered by blacks both in the North and the South, so it is no surprise that in the early-to-mid 19th century black denominations, like the African Methodist Episcopal Church, began to arise in the North as a response to this discrimination. The history of the AME is particularly interesting as this church was formed after a black leader was forcibly, physically removed from his congregation for praying in a "whites only" section of the church. Following the Civil War, racial prejudice and injustice continued and these separate black institutions become commonplace in the South as well. It is very worth noting that these separate congregations were formed not because of doctrine (as is usually the case), but as a response to injustice and prejudice. Yes, they were formed voluntarily, but voluntarily because blacks could not be treated with anything resembling equality within white churches. As the 20th century turned, some whites began to identify and draw attention to racial injustice (though often in a paternalistic manner). When religiously motivated these clergy were almost always mainline or theologically liberal however and as a result, white evangelicals basically set to disown any such discussion our of fear of being associated with such movements. White evangelicals were willing to participate in missionary and educational efforts with blacks, but avoided any discussion of injustice or other "boat rocking" issues (in the early part of the century this was often true of black evangelicals as well). However, in the 1950s and 1960s the black church came to the forefront in leading the Civil Rights Movement though they were very rarely joined by white evangelical support. Billy Graham makes a fascinating case study to illustrate this point. Early in his ministry, he followed the "local customs" based on where his events were held, such as segregating seating sections. At times he very clearly took a stand against prejudice and discrimination, but then the next week would cave to pressure and apologize for making such statements. After 1954's Brown vs Board, Graham never held a segregated event again, but openly stated he didn't believe in changing laws as "laws could not change wicked hearts." His approach to desegregation was extremely gradualist and in response to Dr King's "I Have a Dream" speech he stated, "Only when Christ comes again will little white children of Alabama walk hand in hand with little black children." Emerson and Smith note that this was "not meant to be harsh, but rather was what he and most evangelicals perceived to be realistic." A concern for matters deemed to be eternal, a fear of theological liberalism and political socialism, and entrenched historic separation lead white evangelicals to have nothing more than empty words of "support" to offer their black brothers and sisters in the faith. While there is much in the past 50 years that could be added, the events above establish the key patterns at play within evangelicalism and the problem of race. Next, I will dive deeper into the contemporary issue of segregated churches and why I contend this is a negative for the church. Thank you for blogging about this issue. It's really been on my heart lately, and my mom mentioned the same thing to me last week. This leads me to believe that the Spirit is currently working in this area of our lives!